A Patronal Festival is the celebration of the Patron Saint of a church. Ours is St Catherine of Alexandria whose saint’s day falls on 25th November and the place for us to have our Patronal Festival is therefore the Sunday nearest to that date each year. If Pentecost is the Birthday of the worldwide church, a Patronal festival or Saint’s-day is the Birthday of the local church. So for our Patronal Festival at the end of this month we will focus a little on what Catherine the saint still has to offer us as saints in the 21st Century. We will of course pray for our church, its life, ministry and future. I hope we may also manage birthday cake ?? We shall certainly sing ‘Happy Birthday dear St Catherine’s…….’ and our Sunday School children will take an active part in this service. – for the Sunday School teachers’ meeting this week and the Council meeting on 25th November. – no Bible Study this Wednesday 14th November. – as many as possible bring a Bible in their mother tongue on Advent Sunday 2.12. – Bazaar on 1st December – along with all the usual stalls we will be having a children’s second-hand toy and book stall. Good quality toys and books are welcome (no furry animals though please). For more information please speak to Jackie. If you enjoy singing (maybe you were in the school or church choir in the past?) come and join in. Feel free to bring a friend too. We will have three practices to run through the carols and make any decisions about whether we can manage to sing in parts or just concentrate on adding a unison lead for the congregation. – I would like to gather together a confirmation group – not urgent but if you have not been confirmed have a think and pray about this, talk with family/ friends, talk with me….. I am posting some details about what Confirmation is, on the website. – I am also aware that many have not yet signed off the Data Protection form…..
– we are still looking for someone to offer technical help with Macs – specifically the computer variety, it’s not rained enough lately for us to need the other sort! Please contact Kara chaplain@stcatherines-stuttgart.de if you can help. For those who enjoyed reading through the Church of England’s Lent devotional booklet, the C of E has now put together a similar booklet for the Christmas period. ‘Follow The Star: A Journey Through the 12 Days of Christmas’ is a pocket-sized booklet inviting you to travel in the footsteps of the Wise Men this Christmas to meet Jesus. Each one includes a picture, a short Bible passage, a simple prayer and a challenge to reflect or act differently. Together, they form a journey through Jesus? early life ? a journey that will help you take the joy and wonder of Christmas into the year ahead. If you would like to buy a copy of the booklet (cost 1.25 GBP plus postage), please let me know by Friday 23 November, as I will be placing a bulk order via Church House Publishing. The book is also available for purchase as a Kindle version via Amazon. 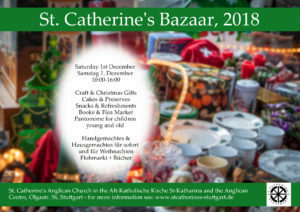 Invitation from the Johanneskirche in Untertürkheim to an EVENSONG on 1st December – for those who aren’t still clearing up or recovering after the bazaar!